Ancient temple of Ain Dara at Afrin. During the Turkish military operation in Afrin at 2018, Turkish shelling had seriously damaged the temple. The Museum of Hama: "According to sources in Syria, the well-known regional Museum of Hama situated in the town of Hama, north-west region of Syria, has fallen victim to looters. Notably, an intricate gilt bronze statue, dating back to the Aramaean era, is currently reported as missing, and there are growing fears it may be trafficked out of Syria to international markets." The Raqqa Museum, also known as the Qala'at Jabar Museum, was looted on 1 May 2012. [by whom?] Stolen items included three figurines of the goddess Ishtar and pottery dating to the third millennium BC. Sidi Yahia mosque, tanks and heavy weaponry installation. ^ a b c d "Robert Fisk: Syria's ancient treasures pulverised". The Independent. 5 August 2012. Archived from the original on 2012-08-06. Retrieved 5 August 2012. ^ "Latest victim of Syria air strikes: Famed Krak des Chevaliers castle". Middle East Online. 13 July 2013. Archived from the original on 2013-10-02. Retrieved 14 July 2013. ^ In the monastery of Sednaya (or Seydnaya), apparently founded by the Emperor Justinian – the people of the village still speak Aramaic, the language of Jesus – shellfire has damaged the oldest section of the building, which dates back to 574. 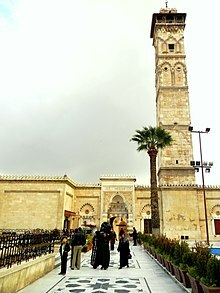 The Umayyad Mosque in Deraa, one of the oldest Islamic-era structures in Syria, built at the request of the Caliph Omar Ibn al-Khattab, has also been damaged. ^ Aleppo citadel hit by shelling, says opposition Archived 2012-08-14 at WebCite, dailystar.com.lb, 11 August 2012; accessed 27 August 2015. ^ "Ancient Syrian temple damaged in Turkish raids against Kurds". timesofisrael. Archived from the original on 2018-01-30. Retrieved 28 January 2018. ^ "Syrian government says Turkish shelling damaged ancient temple". reuters. Archived from the original on 2018-01-28. Retrieved 28 January 2018. ^ Safeguarding Syrian cultural heritage Archived 2015-08-28 at the Wayback Machine, unesco.org; accessed 27 August 2015. ^ Museum of Raqqa webpage Archived 2015-07-27 at the Wayback Machine, ucla.edu; accessed 27 August 2015. ^ Syrian looters in bulldozers seek treasure amid chaos Archived 2017-02-26 at the Wayback Machine, bloomberg.com, 28 July 2013; accessed 27 August 2015. ^  Archived 2017-02-13 at the Wayback Machine, naturerated.com, 12 February 2017; accessed 12 February 2017. ^ UNESCO World Heritage Centre (30 March 2012). "Director-General of UNESCO appeals for protection of Syria's cultural heritage". Archived from the original on 2014-10-18. Retrieved 20 November 2014. ^ "UNESCO Director General deplores destruction of ancient Aleppo markets". 2 October 2012. Archived from the original on 2014-12-08. Retrieved 20 November 2014. ^ "Six Syrian heritage sites declared endangered". 21 June 2013. Archived from the original on 2015-02-10. Retrieved 20 November 2014. This page was last edited on 10 November 2018, at 11:37 (UTC).